Leading off today: Alex McBurnie rushed for a pair of early touchdowns to start James Madison on its way to a 26-8 victory over Eagle Academy II on Sunday for the PSAL Bowl Conference football championship. It was Madison's first title since 2011. The Golden Knights finished their season with an 11-1 record. In the PSAL Cup Conference title game, KIPP NYC College Prep completed a 12-0 season with a 32-0 win over Petrides, which was in the playoffs for the first time since 2011. Keenan Bingham ran for the first score and Ale Wilson added a pair of touchdowns, including one on a 70-yard carry, to lead the way. Girls all-state soccer team: St. Anthony's senior Brianna Passaro has repeated as Class AA girls soccer co-player of the year, the New York State Sportswriters & Coaches Organization for Girls Sports announced Sunday. Passaro scored 21 goals this fall as the Friars completed their second consecutive 17-0 season by repeating as state Catholic High School Athletic Association champions..
She shared the Class AA player of the year award with Arlington senior Kendall Feighan. Class A, sophomore Mia Asenjo (Valley Stream South). Class B, junior Emma Bough (Chenango Forks). Class C, junior Brooke Pickett (Stillwater). Class D, junior Hailee Mitchell (Kendall). Valley Stream South, Chenango Forks, Stillwater and Kendall won NYSPHSS championships in their respective classes last month. The complete all-state team can be viewed here. Picked: Meeting on Monday morning, the NYSPHSAA staff and the girls lacrosse committee have recommended SUNY Cortland to remain as the host of the state tournament through 2022. The final vote on the three-year contract that begins in 2020 will come at the NYSPHSAA Executive Committee meeting Feb. 1. There are a number of requests for bids for other sports championships out in the field at the moment, and the next recommendations to be made -- all for three-year contracts that begin in 2020 -- are girls tennis (to be decided Jan. 8), boys lacrosse semifinals and finals (Feb. 8) and girls soccer (Feb. 13). Proposed: Eleven Buffalo parks and athletic fields, including five at city schools, are being targeted for improvements in hopes of advancing the school district's sports program. by SWBR Architects in Rochester, which was awarded the bid. Among the facilities being targeted is All High Stadium adjacent to Bennett High. There will be three sessions for public input this week. The consultants hope to conduct more public meetings at the end of January, with cost estimates and design plans completed by late winter. "We're trying to find out from the people who use the facilities what they see could be repaired or improved that would make it a more enjoyable experience," said Bill Price, a landscape architect with SWBR and the project manager. "Is that more bleachers? Better parking? Making sure the concessions stands are open when things are going on?" 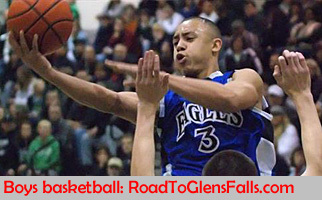 Progress: The annual overhaul of our Road To Glens Falls basketball website is nearly complete, with a few tweaks remaining for the home page and some of the reference files. Similar work will take place early this week on the Road To Troy girls basketball site. The season's first sets of state rankings in boys and girls basketball will (hopefully) be compiled Sunday and be released early next week.